So for Hazel's actual birthday party we had received these wonderful yellow tote bags from Oriental Trading for us to review. Our plan had been for guests to make handprint flamingos on them, however the guests did not want to, so we still had many of the bags. 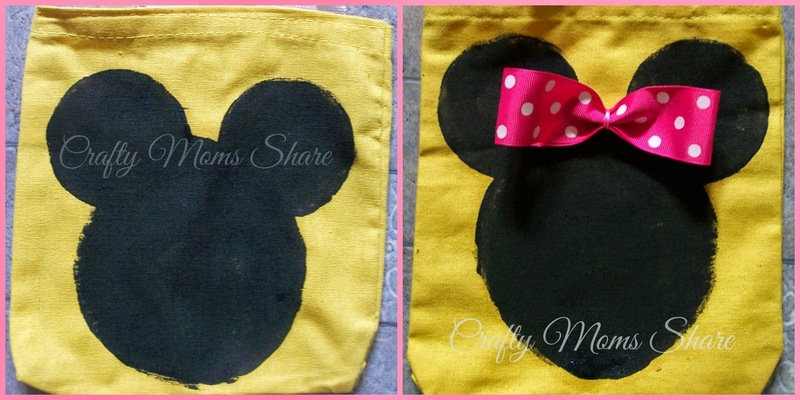 I thought they would be great favors and we could paint Mickey and Minnie Mouse heads on them. My original idea was to get a large sponge and cut it in the shape of a Mickey Mouse head, however I could not find a sponge large enough. Then I thought of the bottom of cups or plates or jars. I tried a few and asked Hazel which size she liked best. I made a small one with a tin for the face and a jar cap for the ears. Then for the larger one I used a small plastic plate for the face and the tin for the ears. We decided to go with the bigger one. Hazel's biggest concern was about adding a bow so it could be Minnie. The bow made it look really cute. I made the bow the same as I did for the ears. Once we had decided Hazel wanted to make one with me. As she made it I took some pictures. Since these tote bags will not get washed I used basic acrylic paint. If I was making a T-shirt I would have used fabric paint so it could be washed. 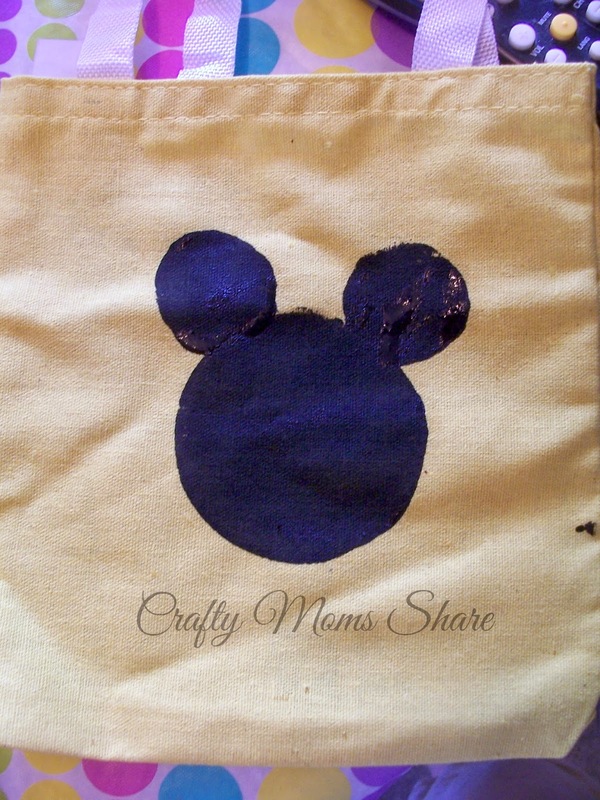 Put something inside the bag--a magazine, some newspaper pages or wax paper work well. This also needs to be done if you are making a T-shirt. It will prevent the paint from going through to the back. 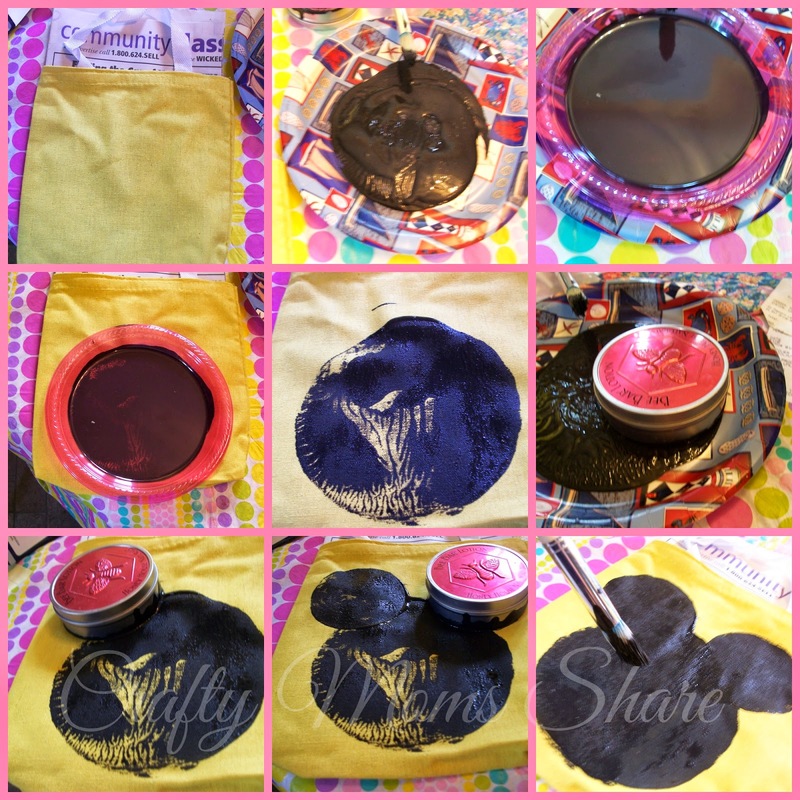 Pour some black paint on a plate so you can dip your objects into it. Try to spread it around a bit. Dip the object you are using for the face into the paint. Twirl it around to make sure the entire bottom is covered with paint. Place object on bag (or T-shirt) and press lightly. Lift up and you should have a circle. Do not worry if there are empty spots like mine. You can fill them in later. Now take the object for the ears and put in paint. Place slightly to the left of the top of circle. Overlap on the circle a bit. Put paint on object again and make other ear in same fashion except to the right. Now fill in any spots with a paint brush and also ease the intersections so they look smooth. Let dry! 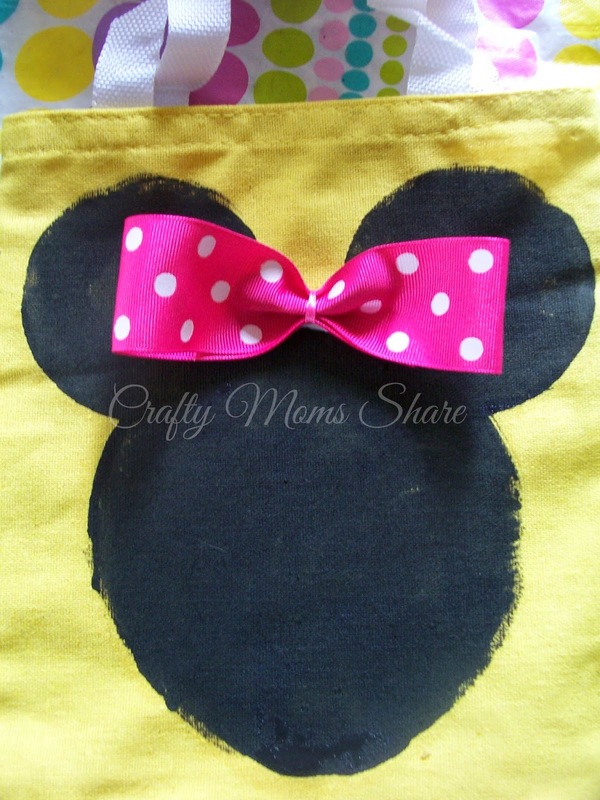 If you are making a Minnie Mouse, make the bow. Glue it on after the paint is dry. I am thinking about personalizing them with each child's name. I like how they came out. 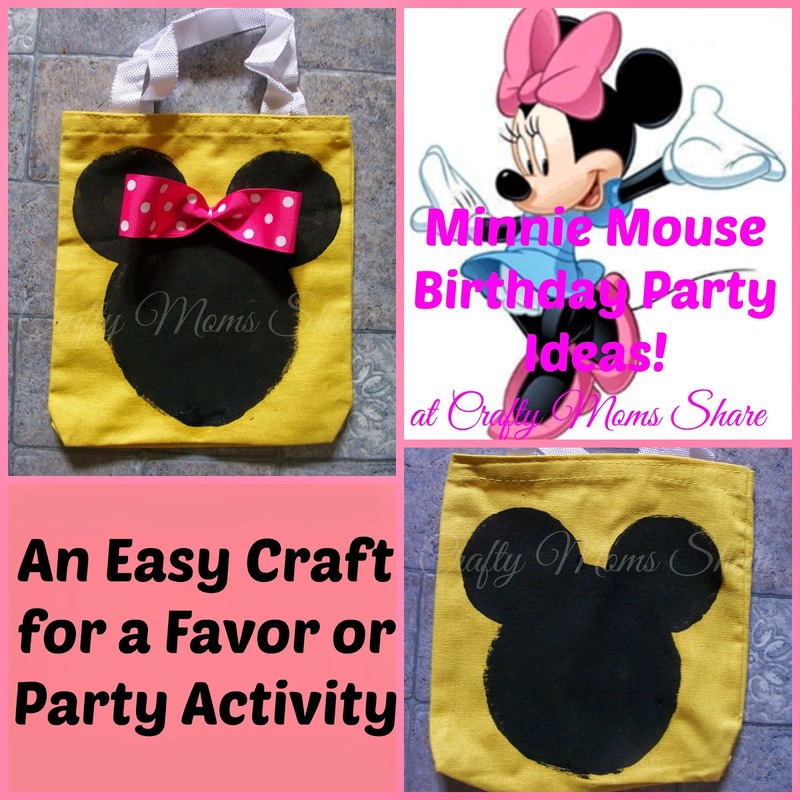 Now the children will have a bag to keep all the treasures they get from the party. What do you think? Disclosure: I was sent these tote bags to review free of charge from Oriental Trading. All opinions in this post are my own. I did not receive any other compensation for this review. I am including links to each item for your convenience but do not receive anything if you purchase them.